Then there is the pollination thing. The bees set that all up. 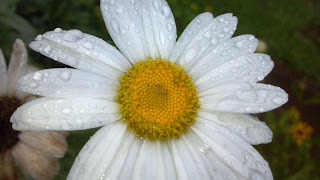 They are the agents for the lovely daisies. Like me, 7 mos pregnant w/ twins. That's as far as I got too. You can tell when the daisies have been pollinated because they start to look tired. They get thick around the middle of their faces. They need extra nutrients for gestation and their petals start to look dull. Eventually, their petals sag. They drag around exhausted and the bees quit visiting. Men should not replicate this bee behavior! When the daisy center is big and round and the petals all but gone, it starts to break apart into individual seeds like a dandelion. Marigolds and black-eyed-susans do the same thing. A lot of flowers reproduce this way. Things that produce fruit and vegetables have a different method. We'll learn about that tomorrow. It's tough being a girl! Chickens, like people, start to release eggs in adolescence. 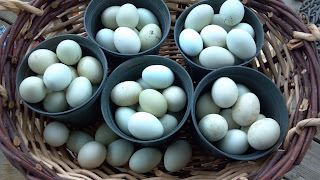 My chickens don't have husbands. No daddy chicken, no baby chicken. It's just an egg. Poor little chickens. They ovulate and complete a cycle almost every day! They must be having a hormone swing almost every two hours! I should be more patient with their bad behavior. Or maybe they should quit pooping in the water dish I just cleaned. Hmmm. Same bat time, same bat channel tomorrow to learn the parts of an apple and squash! 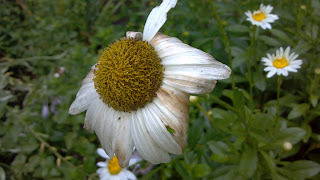 Oh dear, I empathise completely with the pollinated daisy ! Me too. When I was pregnant with twins, stores and restaurants I went into would give me stuff. I think they were afraid I would pop and they wanted me to leave fast. Howdy. I enjoyed your guest post on Garden Rant and am now a follower/subscriber. I enjoy the information and the humor/humour. Thank you so much for finding me! Mostly I'm funny when I'm fed up with something and I don't mean to be. Hope to see more of you! Why don't you have a papa rooster?